Beautiful baby girl... Laila JeanneLi: New pictures of our beauty!!!! There's a great website, ladybugsnlove.com, that will call orphanages for adoptive parents and request updated information. We did this 10 days ago and today we got our updated information. Hmmmm... what should I give you 1st, the 4 new pictures or the information???? OK, stop begging, here's the pictures!! Oh yeah, she had her lip repaired!!! We had no idea she was getting her lip repaired until we got the pictures this morning!! It looks great!! We got answers to 10 questions as well as updated height and weight. She is 26.7 inches tall, weighs 17.6 pounds, has 4 teeth, 2 upper and 2 lower and her feet are only 5 inches long!! She's wearing infant size shoes!! Here's all the new stuff we know about our daughter!!! She hasn't had any illnesses except colds and coughs. She has alot of friends and gets along well with all the other children. Her favorite toys are any that make music. She doesn't like strangers and is afraid of them (bad for us!!). Her personality is described as easy going, lively and gets along well with other children. She sleeps on her back. She crawls and stands by herself and will walk holding your hand. She likes to go outside. 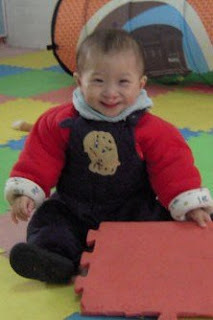 The orphanages wish for her when she grows up is that whe will remember and love China when she is grown. We are so thrilled to have this new information and the pictures, it's priceless!! In one of the photos you can see a lady's hands and it looks like the sign for play. We are hopeful they are using sign language with her, Scott and I plan on using sign language with her so this just gives us all a head start. Once again, please leave a comment, we will be adding them all to Laila's book!! Thank you all so much for your love and prayers!! What a cutie pie! Thank you for updating your blog so fast with the new pictures and info of little miss. Awe!!! So sweet!!!!!! What priceless photos to have... and what a huge surprise about her lip being repaired! Hope you get your LOA soon!!!! How wonderful to get updated pictures and even more information!! Yay for Laila!! Laila is such a cutie-patutey! How incredible is it that her lip has already been repaired! We cannot wait for you guys to get to hold her in your arms. It's going to light up your world! So happy for you! Thanks for sharing your journey. Love her smile! She lights up a room! Look at that beautiful smile. Oh my gosh, you must be dying to get your hands on her and hear her giggles. What a doll! Wow, that is so exciting. She looks like such a sweet heart. I am surprised they fixed her lip. So nice and great you found out so many amazing things about her. I hope you have her in your arms soon. Adorable!! You and Scott must be over the moon! What a wonderful surprise to see she is being taken care of so well. I'm so excited! She is so precious and I can't wait to hold her myself. Come on LOA!!! I am so happy for you guys!!!! She looks amazing and sooooo happy! Congrats! That's fantastic and what a beautiful smile. Laila looks so precious. I bet you cannot wait to hold her and kiss those lovely lips. I found your blog via a follower (Amy & Jason) of Lemon Drop Baby Boutique. Any way, I have 2 China kiddos and want you to know that your girl is so precious. So great that you have gotten photo updates. I will be bookmarking your blog to watch your travels. Best wishes!! She is beautiful - and I LOVE her name. What a gift!! She is a precious delight. We are anxiously waiting for her to be here with us. We are so excited for you to hug her tightly. What a blessing.